This week, the Foreign Ministers of the North Atlantic Treaty Organization (NATO) countries met in Washington, DC. 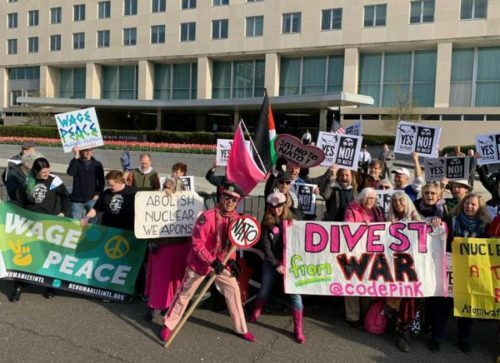 NATO was greeted with bi-partisan support from Congress and by protesters who held actions and events from Saturday, March 30 through their meeting at the US Department of State on April 4. Black Alliance for Peace, (left to right) Paul Pumphrey, Ajamu Baraka, YahNé Ndgo and Asantewaa Mawusi Nkrumah-Ture at No 2 NATO in Washington, D.C.
During the week, NATO Secretary General Jens Stoltenberg had a friendly meeting with President Donald Trump where they talked about expanding NATO and having NATO members spend more money on militarism. When Stoltenberg spoke before a joint session of Congress, he was given repeated bi-partisan standing ovations. In his speech, he called for more funding and applauded Trump’s efforts to increase funding for NATO. The next day when NATO foreign ministers met at the State Department, hundreds of protesters were outside showing opposition to NATO. A coalition of peace groups came together for this protest and events throughout the week calling for disbanding NATO. Breaking from the bi-partisan support for NATO, Howie Hawkins, who announced an exploratory committee for Green Party presidential nomination, joined the protests calling for an end to NATO and dramatic cuts to the military budget.